Traveling to Cuba with us on this tour makes a difference, especially to the local staff who work as tour leaders, guides, drivers and hotel staff. Although wages in Cuba are set and strictly controlled by the government we look to provide our local staff with other, non-monetary incentives instead (although of course tips from groups are always welcomed!) – we recently invited one of our more long-standing local leaders over to the UK for a visit and training. 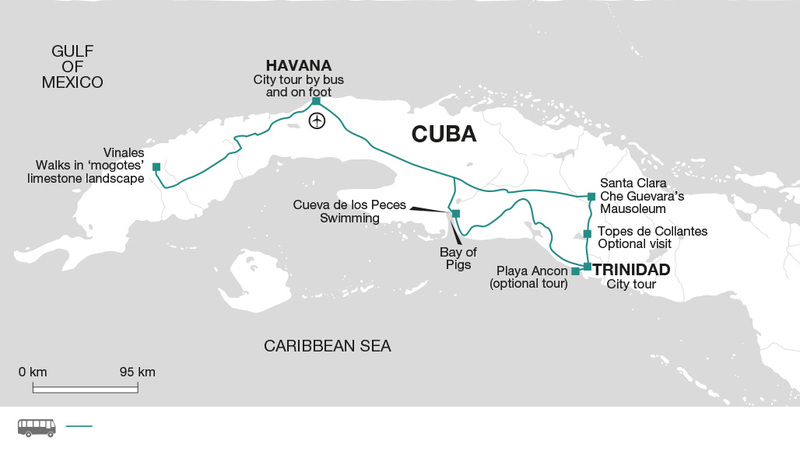 Overseas travel for Cubans is almost unheard of and a trip abroad really is the opportunity of a lifetime for a Cuban. We have also conducted training courses locally for our leaders and provided them with everything from first aid kits and walking boots to mobile phones – consumer goods are very hard to obtain in Cuba so these items are necessary but also gratefully received. Our group size is relatively small, no more than 18, which allows us to use smaller, less polluting buses and also minimizes the impact we have on the places we visit. Due to the scarcity of consumer goods in the country, Cubans are excellent at recycling and almost nothing goes to waste (hence the huge number of 1950s American cars that are still driven today – not because Cuban’s are American car fanatics but because keeping them running is necessity). During this trip we only stay in casas particulares, which are locally-owned homestays, with usually between 4-8 beds. The money from our visits goes directly to the owner of the house, and they also cook up some hearty meals for their guests!